Food Stamps Have Evolved A Lot Over Time. Is Trump's Harvest Box Next? As Donald Trump suggests a radical change to SNAP, we look back at the history of government-assisted food programs. Giving money to low-income Americans is highly controversial. Millions of taxpayers suspect abuse and misuse. Millions of others call it an absolute necessity for nutrition and survival. Food stamps — instead of cash — were designed to bypass that debate. They didn't. 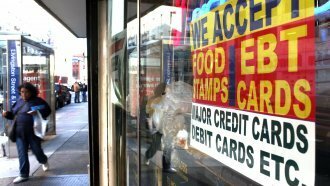 Today, President Donald Trump and Congress are considering major changes to food stamps. Food stamps started during dire times. FDR came up with the plan during the Great Depression, and like the name suggests, it started with stamps: little orange and blue ones. The government bought up struggling farmers' excess food at discounted prices. Meanwhile, eligible Americans bought orange stamps for $1 apiece. By buying the orange stamps, participants were forced to spend this stamp money only on food and other necessities. In return, the government gave them 50 percent more money in the form of blue stamps that they could spend on farmers' surplus produce. It was a win-win; poor families got extra food, and struggling farmers found buyers. As the Depression ended, so did the program. But JFK brought back pilot forms in 1961, and then LBJ nationalized food stamps in 1964. Jimmy Carter tossed out the requirement that people pay for food stamps. Ronald Reagan cut the budget and narrowed eligibility. Bill Clinton created a three-month eligibility time limit for many non-working adults. Under George W. Bush, states completed the switch from actual stamps to debit-like cards, called EBT, with the goal of reducing fraud and stigma. And Congress also targeted stigma, changing the program's name to the Supplemental Nutrition Assistance Program, or SNAP. While participation surged from 26 million in 2006 to a peak of 47.6 million after the Great Recession, the recovery has slowly driven participation down to below 40 million. Each of these recipients receives about $125 per month in electronic vouchers. So that's where we are. Where do lawmakers want to take us? In spring, a Republican House bill narrowly passed that benefit eligibility would require 20 hours of either work or job training for most able-bodied adults. Meanwhile, a Senate bill with bipartisan support — which is necessary in the higher chamber — would fund new programs to facilitate work, but no new work requirements. As for President Trump, he's been thinking outside the box — or more accurately, about a box. Trump suggests the government ship boxes of food to your doorstep — think Blue Apron. He's calling it "America's Harvest Box." It would cut benefits by about $17.2 billion in 2019. It's a storied program with lingering controversy. Work requirements. Job training. A box at your doorstep. Food stamps are in a state of flux yet again.